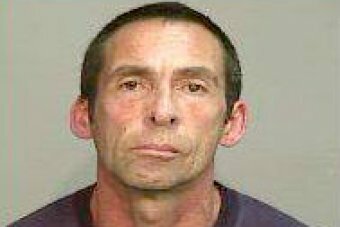 A manhunt is underway in Sydney’s east after a convicted murderer out on parole managed to remove his monitoring anklet while receiving medical treatment. Damien Anthony Peters, 50, pleaded guilty to murdering and dismembering two of his male lovers in 2001. The court heard Peters, then 32, had stabbed Tereaupii Akai, 50, twice in the neck before cutting up his body and throwing it in a council bin. About eight months later, Peters stabbed 57-year-old Bevan James Frost to death before cutting up his body. Detectives investigating the disappearance of the two men found their remains in the bath when they went to Peters’ flat. He was jailed for 21 years, with a non-parole period of 13 years, in 2002 — he had been on parole since November 2016. The killer was last seen at the Prince of Wales Hospital in Randwick around 4:15pm yesterday afternoon — police were immediately informed when he went missing. His monitoring anklet was found four hours later in nearby Kensington — police said it was forcibly removed. Police had urged people to not approach him and ring triple-zero if he’s sighted.